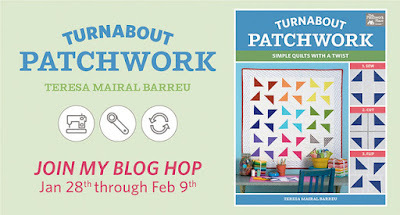 I received a free digital copy of Turnabout Patchwork: Simple Quilts with a Twist by Teresa Mairal Barreu from Martingale in exchange for making a quilt for this blog hop. Welcome! Thanks for visiting my blog for my stop on the Turnabout Patchwork Blog Hop. I'm excited to be a part of the blog hop and to promote Teresa's new book which is available on Amazon or from Martingale. 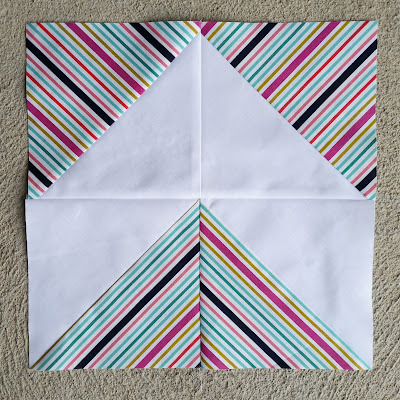 I was drawn to this book because I love starting with basic quilt blocks (like half square triangles) and rearranging them or randomly sewing them together to create quilts. It took me awhile to start this project because I knew I wouldn't be able to get all the stripes matched up. (I have my vivid memories of my mom checking that my stripes were lined up correctly on my childhood sewing projects.) After I made one block, I realized it didn't matter if the stripes lined up or not! Because I had some other projects going on, I decided to make a small baby/crib quilt. 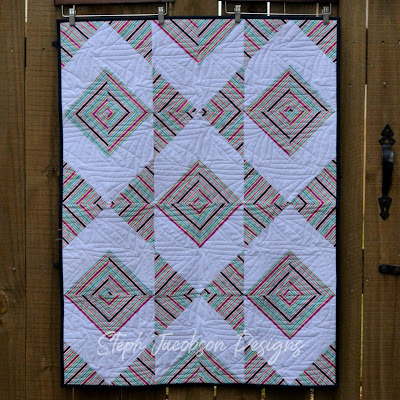 I love how just 12 of the Arrowhead quilt blocks make such a fun quilt. I've been trying to only use my fabric stash this year, and I had the perfect Moda teal polka dot fabric that was just big enough for the backing. I used a dark navy solid for the binding. I longarmed the quilt on my APQS Lucey. I used the Papyrus pantograph from Urban Elementz. As part of the Blog Hop, I'm giving away an electronic copy of Turnabout Patchwork! To enter, just leave a comment on this post. 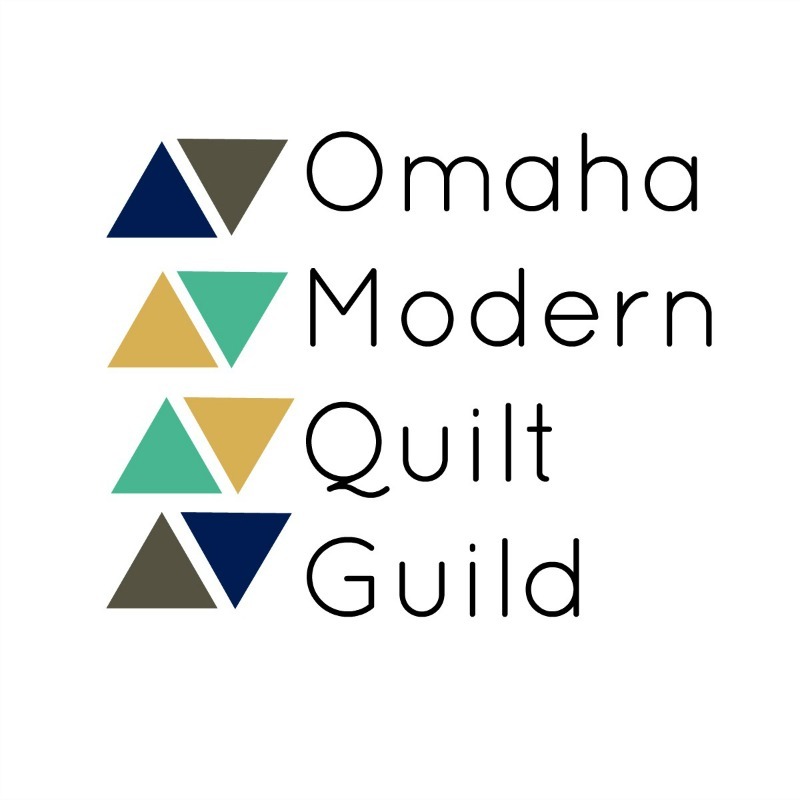 I would love to know what quilt or quilt project you're currently working or what you have on your quilt to-do list. The giveaway will remain open until 9pm CST on Friday, February 8. At that time, I'll randomly select one winner. If you're a no reply blogger, please make sure you leave an email address so I can contact you if you win! 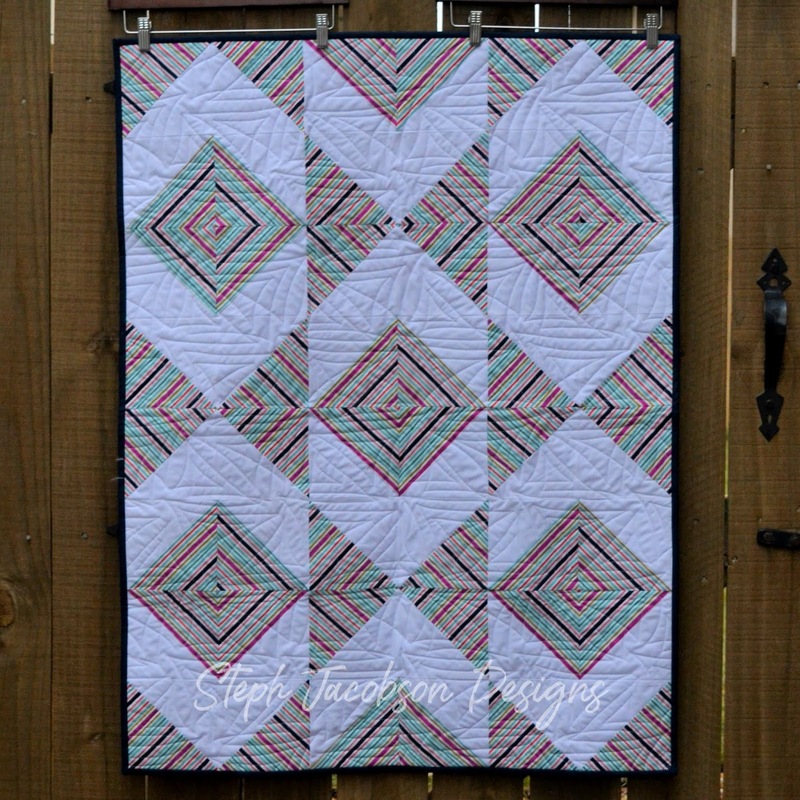 Be sure to check out the quilts made by all the quilters on the Blog Hop. Many of them are giving away a prize, so there are a lot of chances to win! Thank you. I am working on the Harry poPott QAL, a temperature quilt and finishing a family 100 year UFO. Love how the stripes don't match - oh my, the challenges of sewing plaids and stripes back in my 4-H years! I am working on a thank you heart mat for a very special music teacher. I love the different arrangements we can make with these quilts! I've finished tops for a baby quilt to give as a gift and a large quilt to donate to our school's fundraiser--now to quilt them! I really like how your striped quilt came out. I am currently working on a scrap quilt that requires 938 2 1/2 inch blocks. It has decreased my scrap pile a lot, but I will be so glad to finish it and do something fun!! I've started a monthly color challenge quilt, as well as a quilt using my aboriginal prints. I like your stripes! I've always been reluctant to work with striped fabrics but you've done a great job! Currently I'm working on charity quilts for church. Adorable! I found a stack of HST’s I started in last summer’s 4-H workshop so I decided I should do your Modern HST BOM. I made January yesterday and have February laid out on my work bench to sew together tonight. I adore all of those stripes! I have so much going on, in the half-made stages. I must get some finishes done so that is what I've been concentrating on since the beginning of January. 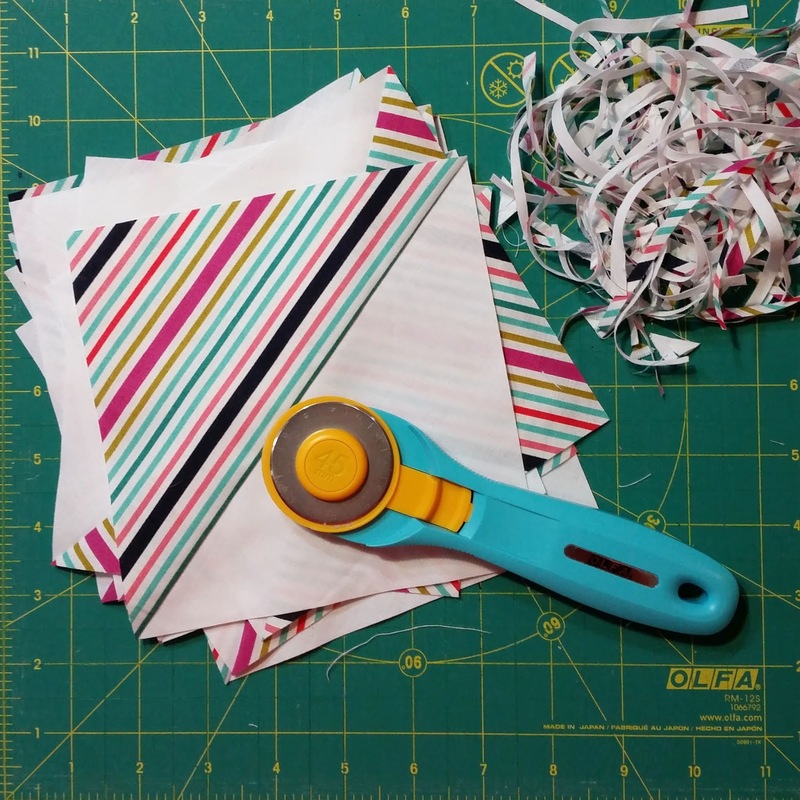 And Much like you, I am going to stash piles and using up fabric, even going to lengths of assigning each fabric to a specific project, cutting it out and storing it and the pattern or book in zip-pouches for the future! My to-do list includes a LARGE (king) utility quilt for our new bed. Am still considering what pattern to use with my collection (also large) batiks. 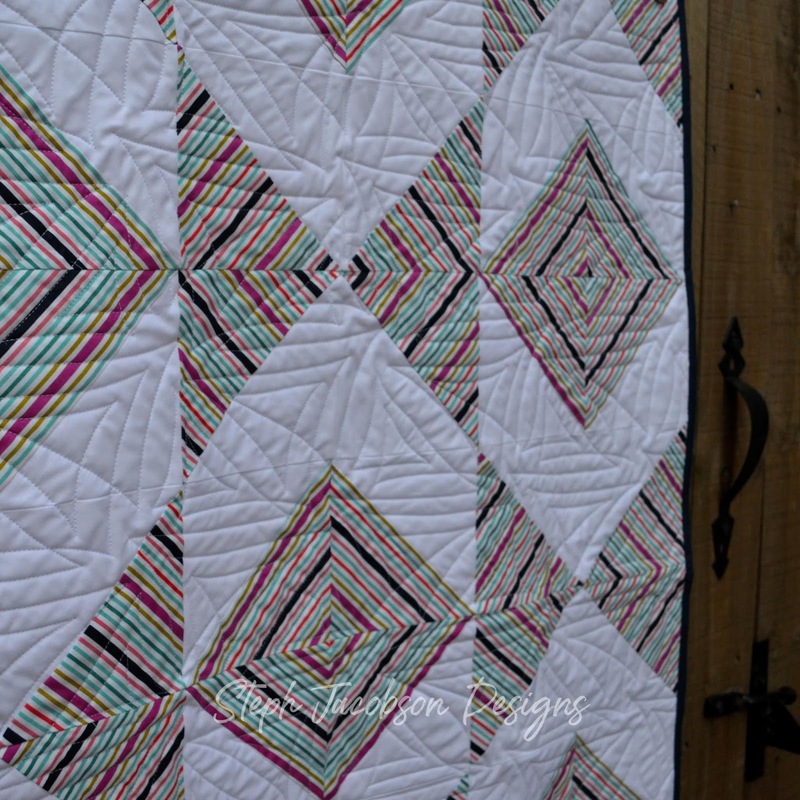 Love the striped fabric you used to create this great baby quilt!! I have just finished pinning a quilt so I need to try to quilt it on my DSM...not my favorite place to quilt but my longarm is 750 miles from me!! I really like this striped fabric, and how the baby quilt turned out. Wonderful job. Somehow I got distracted by knitting projects, now I need to get my quilting mojo back. I love stripes! Maybe this blog hop will get me motivated. I just picked up a panel that will be the centerpiece of this year's veteran's quilt. I make RWB blocks for leaders and enders, and before I know it I have enough for a quilt. Under my needle today is a UFO baby quilt I'd like to finish soon. Thanks for the giveaway and the example of one of the quilts. Those striped and plaids I sewed with in high school - matching was essential. 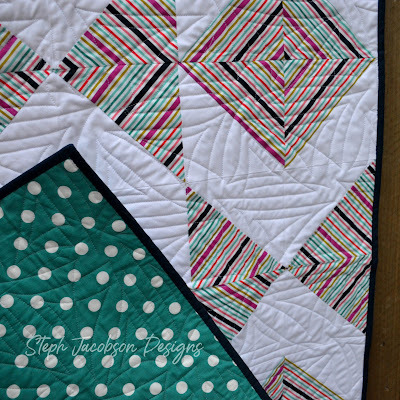 Your quilt is a fun twist on a traditional block. I like the use of strips too. I have just finished quilting (on my domestic machine...)a baby quilt for my nephew and his wife and am trying to finish a UFO left by my mom. Just have to quilt the border. Thanks for sharing!! I am using my walking foot to quilt up a large block and turn it into a pillow cover. Easy way to practice my quilting. 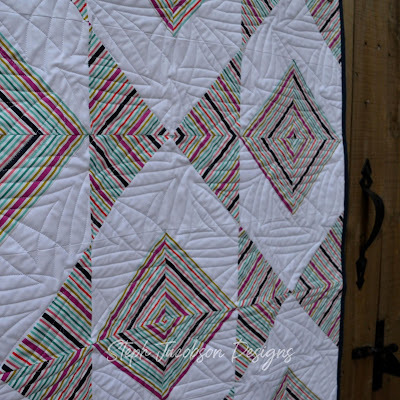 What a fun quilt that is! Using up stash is always one of my goals when I take on a blog hop - glad you were able to do the same. I did one of her quilts for the B&W hop a week or so ago-really fun! I just finished a very hard one so I'm onto easy stars now. Just blocks and flying geese. I really love this design, and the fabrics you chose! I'm working on several projects at the moment. One is small paper pieced moth blocks, and I'm following along on a 52 Blocks in 52 Weeks SAL organized by Canadian Quilters Assoc. Meanwhile, I am planning a Sessoms quilt (Carolyn Friedlander). Your quilt is really neat. I love the stripes. I am working on several great niece quilts, the #charmcollective challenge to use some of my charm squares and participating in the #scrappytripalong2019 to finally get some of my WIP's finished and stash used. I'm beginning to love stripes after seeing all these projects. I have just finished a baby quilt. Love the stripes and the way the way you arranged the blocks! This is a really clever block, especially with the stripes you chose.